"Blame it on the (robot) boogie"
Robots pretty much go with everything and afros are no exception. After getting a bit of time with a pre-release build of Fugazo's WiiWare debut, Frobot, we'd have to say the hairstyle is as fresh on a machine as it is a human being. 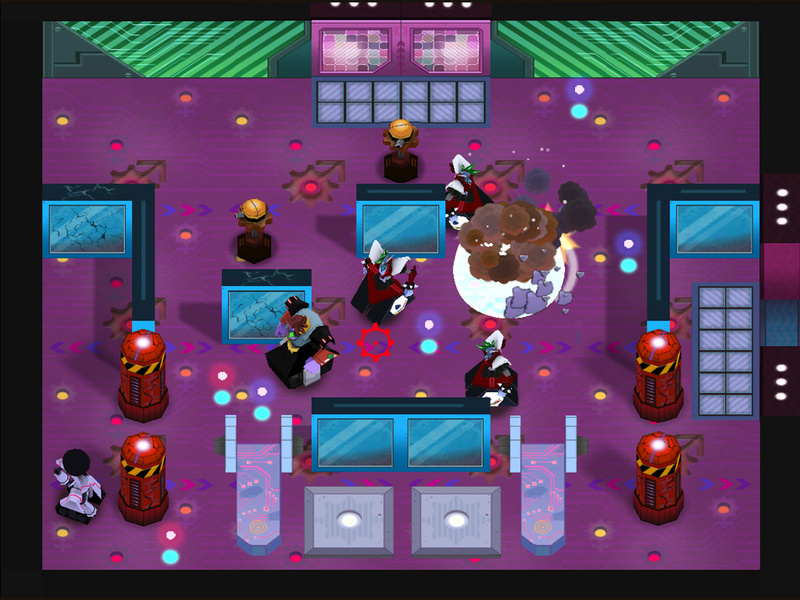 Navigating menus displaying a fun '70s look to the "Single Playa" game, you'll find that Frobot is an action puzzle game that looks and feels vintage 8-bit '80s with a toe-tapping soundtrack firmly in the dance halls of the disco era. Players are placed in the role of the titular Frobot, a Shaft-esque robo-dude who's popular with the robo-ladies. Unfortunately the jive robots at Microshaft are taking over and have abducted four of Frobot's dancing partners; with them four of the special powers that make him the funkiest 'bot around. Level 0 sets up the story and acts like a tutorial to the different abilities that get taken off Frobot in the beginning of the game. 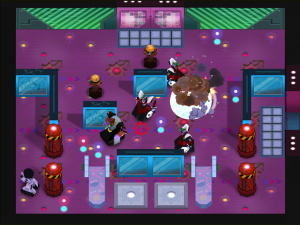 Whilst you always have a blaster and the mines, the others must be regained by winning the boss battles the happen after every fifth level is completed. 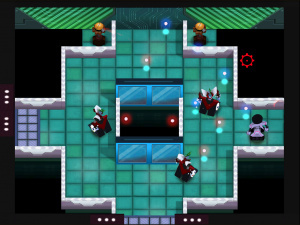 Secondary weapons are mapped to the D-Pad, with the currently active one indicated by an icon in the upper-right corner; among them missiles and a weapon you guide in real-time. The puzzles require use of whatever abilities you have to hand. Initially Frobot is equipped with a blaster and the ability to lay mines, but others such as speed boosting and a guided weapon will become key to navigating levels later on. Gameplay consists of figuring out how to unlock doors to reach triggers which must be shot in order to activate the transporter in the starting screen so you can travel to the next level. You'll encounter enemies in the form of Microshaft robots and gun turrets which are either to be destroyed or evaded. Sometimes the door to the next room simply requires destroying all enemies in the current room, but often you'll need to hit a couple of triggers with some fancy shooting or hit a couple of floor plates by manoeuvring boxes into place. Hitting targets is a breeze thanks to the use of the remote pointer as a mouse-analogue - moving the cursor rotates Frobot's upper torso, whilst the analogue stick rolls him about on his treads. You can pick-up and drop objects (where applicable) using Z. The puzzles strike a good balance between challenge and fun — you won't break your brain trying to figure them out and there's enough variety of actions required to progress that you won't get bored, with destroyable walls, catapults and motorised barriers to move. Enemies will keep you on your toes with their deadly accuracy. Selectable difficulty is a matter of how many lives you want to try to assail the levels with. The 15 lives offered on Easy seemed excessive at first but we were losing Frobots left and right to deadly ricochet fire — not only from enemies, but Frobot himself. Reigning in that trigger finger is definitely the order of the day. Whilst the robots are all 3D polygons there's a definite 8-bit computer vibe to the proceedings, probably due to the use of purple and green on the walls and chunky background objects. It's quite appealing to our rose-tinted retro eyes, though we've been told shadows will be added later on to give more depth to the backgrounds, which should help the doorways stand out a bit better than they do presently. There's some nice little touches like Frobot's shoulder movement when he rolls forward, giving him a sort of robo "strut," nice particle effects when things blow-up (especially Frobot himself) and cute dialogue sequences that maintain the "blaxploitation" tone of the game's protagonist. The music deserves special note: a nice disco tune that reminds us of "Car Wash" and the fun, kitschy parts of the '70s — you'll be hard-pressed to resist bouncing to the beat in this one, folks. Replay incentive is present in the form of golden trophies to earn for completing the levels within a target time limit; each level also has an afro pick to find by completing an extra task which isn't always that obvious. Apparently every five found will make you more funky so you'll want to make sure to find them all, though in this build we didn't see anything to indicate which levels had been completed in that regard. If you have friends over you can play the "Multiplaya" game: an arena battle that takes place in one of 10 rooms, each of which has a unique aspect to it. Only five Multiplaya levels are available to start with the remainder needing to be unlocked. 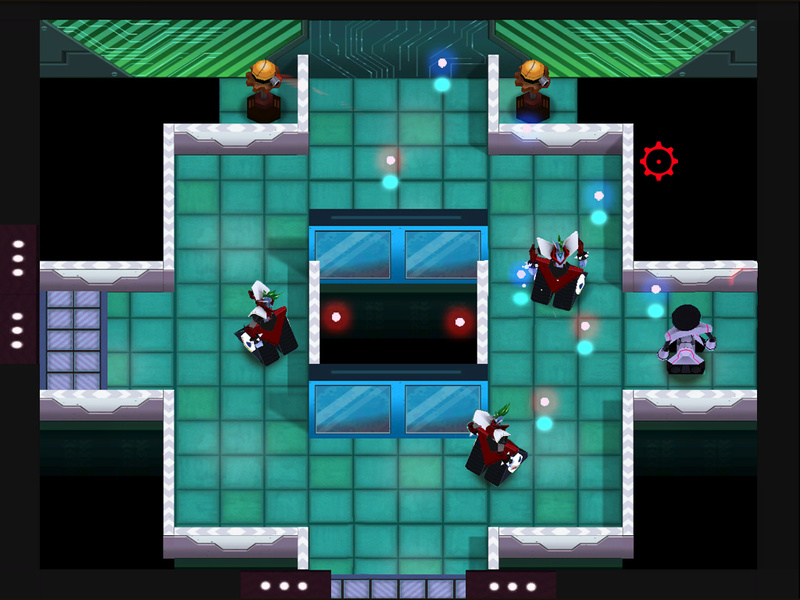 They feature columns and destroyable walls, moving platforms and, craziest of all, a ton of colour-coded teleporters. Players are given the full Frobot arsenal and a stock of lives; winner is the last 'bot standing. There's no AI stand-in (maybe this will be addressed prior to release?) so you'll probably find a more satisfying madcap experience with three or four players rather than two. Though only the first five levels were playable in this initial build of the game, we definitely think this is a game that's shaping up nicely as a unique and welcome addition to the WiiWare library. We're looking forward to seeing more of Frobot's victory dances in the future. Been looking forward to this one for a while! "Robots pretty much go with everything and afros are no exception." Nice impressions Sean!! I can't wait for this. It will probably be in the 500-800 Nintendo Points and after Robot Rescue I think I'm ready for another robot puzzler in the next month. I want the "Shaft type" song that they had in the video. Is that not in there? Be cool if it was. No, the song from the trailer wasn't present, but this is an early build of the game with only five playable levels, so I expect some added touches and hopefully that song will make it in there. The song from the Trailer will be in the final game. We're actually working on an Director's Cut (Extended Version) of that song that will ship with the game. Thanks for the great feedback!